When I was 12 years old, my father passed away from AIDS. Luckily, my father’s sister (my aunt), legally adopted me when I was only a baby, and gave me a life full of love and happiness. As I got older, my aunt (now my legal mother) told me about my birth mother, my brothers, and how they passed away. I would visit with my father on and off, but he had his own demons he was dealing with, which eventually would kill him. These major life events definitely affected me growing up, but again, I had such an amazing family to support me, that I chose to always live my life to the fullest and to live my life for my family that had left me so early on. I definitely had normal anxieties about death and being left behind, but it was always something I managed and dealt with growing up. I always felt my mother’s presence with me too. Even though I was only a baby when she died, I felt 100% connected with her then and now. My mother died when she was only 30 years old. As a child, you think 30 is old, but when you actually turn 30, you realize how young you are and how your whole life is in front of you still! When I turned 30, I couldn’t stop thinking about my mom, and how her life was still so full of every hope and dream. This saddened me a lot, now realizing how much of her life was lost. It’s almost like I was feeling all her pain and sadness. This stuck with me as a mother but didn’t really cause any issues until I had my second daughter. While nursing my new baby, I developed a bad case of Mastitis, which is a bacterial infection that happens when milk gets clogged in the breast and cannot be released properly. I had it once with my first daughter but was able to take antibiotics for it, which cleared up without any issue. When I got it again, for some reason it was being very resistant to the antibiotics, and I ended up in the hospital and put on super heavy antibiotics to clear the infection. A few weeks after I was done with all the medications, I started feeling really sick, like a bad stomach bug that wouldn’t go away. It turned out that my gut had been wiped clean of all the good bacteria while being on all the antibiotics. This, with a combination of the stresses that come with being a new mom, was too much for my immune system. I developed “c-diff”, which is a superbug that attacks your intestinal track and can kill you if not treated properly. Again, I was put in the hospital, and again more antibiotics. This is when I experienced my first panic attack. In was the end of November of 2014. I had no idea what it was! I thought it was the antibiotics at first! My hands were tingling, my heart was racing, I couldn’t sleep, I couldn’t let down to nurse my baby girl, I was shaking, I felt nauseous, I could barely eat. It went away when I got to the hospital, so I thought it was simply my sickness and being a bit stressed, but then it came back and came back again. Soon, my days were full of panic, and the nights were even worse. I had no idea what was going on with me, and I was quickly spiraling out of control trying to figure out what was happening. My doctors told me it was postpartum anxiety and put me on the usual anxiety meds. The next few months were rough, but I got through it with the help of therapy and acupuncture. Once life was back to normal, I chalked it all off as postpartum anxiety, and it would never happen again. Nine months later… it all came back. Why? Because I got Mastitis AGAIN, and my mind automatically raced to thinking “Oh my God, what if I have to go through all of this again?”, “What if I get that sick again? What if I die!”, “I can’t do that again!”. The panic attacks came back full force and I didn’t know what to do! I was so scared and didn’t know how to control them. The more scared I got, the worse the panic got. I started going to therapy again, tried medication again, acupuncture, but nothing was working. I just kept getting more scared and feeling more helpless. Then, in June of 2016, I found DARE. I was researching online about books for panic/anxiety and found a video of Barry speaking about his new book. So, I looked it up on Amazon and decided to try it out. I remember the day it came in the mail so vividly. I remember opening the book up and reading the first few pages on my staircase, and crying tears of joy thinking “Yes, Barry knows exactly what I am going through, and this book can help me!”. I read the book over and over and over again, each time finding new pieces of information that would help me recover from the panic I had been experiencing. The book slowly taught me not to be afraid of the sensations I was feeling, and to control my intrusive thoughts. It also taught me to love myself deeply, and to build up a self-confidence inside of me I had been lacking my whole life. This journey through your anxiety is a tough one, and you have to be strong to get through it. But, just like Barry says, if you commit to the DARE process and believe in it (and in yourself), you will get through it! Boy were there times when I almost gave up, doubted if DARE really worked, got angry at myself, was afraid I would never get better… but I did! Your journey to recovery will be all over the place, and you will have many ups and downs. No one’s recovery will be the same as another person’s because each one of our paths is different from the other. But the good news is, we have each other to encourage, to push and to lift up along the way! This DARE family with the amazing support of Barry, Suzane and Michelle is a gift to all of us and a reminder that we are not alone in this very normal struggle! DARE teaches us all that anxiety is NOT something to be ashamed of, that many people suffer from it, that you can completely control it, and there is nothing to be afraid of! We are in control of our thoughts and feelings, and DARE teaches you how to do this all. Not only has DARE completely helped me with my panic attacks, but it has made me a stronger, calmer, and a happier person. Before DARE, I would worry about everything, and had low self-esteem and self-confidence. While the “worry gene” will always be a part of me, I have learned to say “So what!” to my worries, to accept and allow sensations as they pop up, and to love myself completely. This, in turn, has made my life so much better. If you had asked me if I was grateful for my anxiety when I first started experiencing panic attacks, I would have said, “F NO!”, but now, thanks to DARE, I am glad this happened to me. I feel like it was a life lesson that needed to happen in order for me to fully enjoy the rest of my life for myself, as a mother, and as a wife. DARE was the best gift anyone could have ever given me because it taught me that anxiety is a normal thing that millions of people go through, and it made me a stronger happier person. I look at life so much differently now and feel so very blessed to have the life that I do, and to see things in such a different perspective. I am so very close to a full recovery, as I still experience my morning sensations on and off, and have intrusive thoughts from time to time, but the difference now is that I am in control of them. They don’t bother me anymore, and I know with just a bit more work, they will never bother me again. For everyone still pushing through their anxiety struggles… you can do this! Believe in yourself and never EVER give up. Look yourself in the mirror every day and tell yourself that you love yourself and that you are proud of yourself for getting through this journey. Smile at your anxiety and tell it who’s boss… YOU ARE! Let yourself have bad days, but don’t let them discourage you too much. Tomorrow is another day, another day to practice getting your life back better than it ever was before. Lastly, I am eternally grateful to Barry for writing this amazing book and the knowledge he has passed on to all of us, to Suzane for being the best mentor anyone could ever ask for and for having the largest sweetest heart in the world, to Michelle for her perfect advice and for making me laugh through my anxiety, and to all of my DARE family for lifting me up when I needed it most and reminding me I can do this. Something we all need to remember, and something Suzane has told me in the past, “You are stronger than you give yourself credit for”. Yes, you are. What a great story. How can I reach Suzanne and/or Michelle? I’m on a similar journey myself. Thank you for sharing your story. You are a warrior! Such an inspiring & courageous journey . THANKYOU for sharing . Thanks for sharing your journey! I am new to the DARE process and very hopeful that this along with my therapist will send me on my road to recovery! Very touchy and success story.I have learned a lot.Thank you. Thank you for sharing it is inspiring to here how far you have come. Thank you for the amazing inspirational story Elyse!!!!!!! thanks a lot to tell us your story , i was also in the same situation . for a long time i was sad not to see my family very long , and when i saw them after some times i had a terrible panic attack . it was just like an explosive which needed time to be exploded , thanks god and my family who helped me very much , i am better now . my advise for you is not to push hard for any thing ,take your time ,love the others and think good. 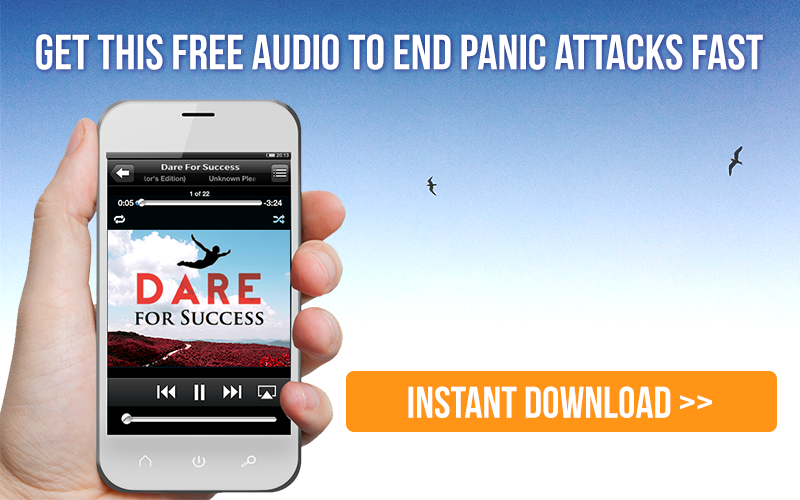 I wish every single one of you support in your journey to beat anxiety and panic! Thank you! So very inspiring. Thanks a lot. Thank you so much for sharing! I lost my husband when he was 26 and I was 23. We had three children ages 6,3, and 15 months. Much like you when I reached the age he was when he died I started to think about how young he was and all of the grief hit me like a ton of bricks along with all the other stresses going on in my everyday life. I was 26 when my panic attacks started. I am not 100% recovered but thanks to Barry’s book I no longer cling and cry to my fiancé when he has to leave and I am able to be home more and more. I still have trouble driving alone but work on that little by little. Elyse…heart wrenching and at the same time a true Profile in Courage. I Wil Re read your story when having a bad day…between DARE and Barry and all of the postings that I have read, I know I will fully recover. Thank you for your words of wisdom. Thank you for your inspirational story! I am currently trying to get off of my medication that I have been on for 18 years dealing with anxiety off and on. I ordered the DARE book a couple of weeks ago and couldn’t put it down. I am hopeful this will be the key and tools that will help me be medication free! I am still very apprehensive and thinking I am worse then everyone, but these stories are truly inspiring! Hope your still doing well! Thank you so so much. True inspiration. I have been familiar with Joe Barry’s work since mid 2000 before updated the information to DARE. There are many who understand how to deal with anxiety and panic attacks and how what causes them and book back to the 1950’s so doctors knew all about anxiety, but often chose to give tablets or send people to psychiatrists who gave us strange labels and insisted we would never be cured. Even now they just look at you as if they haven’t a clue in many cases. So often we missed the alternative options, but there was a lot of information and in particular one which we still have a great deal of access to is a lady called Claire Weekes who Joe mentions as one of her mentors, and he works in the same way as she did. She worked in the UK, USA and Australia curing thousands doing talks on the BBC and records at that time as well as having personal clients. Her books, some CD’s are available and also on uTube and although the information is the same as a woman she adds something and also puts things in a way that makes you feel she will take your hand and go with you. She like Joe also suffered from anxiety. It matter little where we get the support as long as we get it. My experience is not very positive as despite having huge amount of knowledge and at one time believing I could overcome I have not as yet but heartily but support all of you who have ignored the negative responses to doctors and looked for something that is working for you. You are so brave. Thank you for sharing your story. Struggling with Anxiety can be a lonely road Reading your story gives me hope on my recovery process.